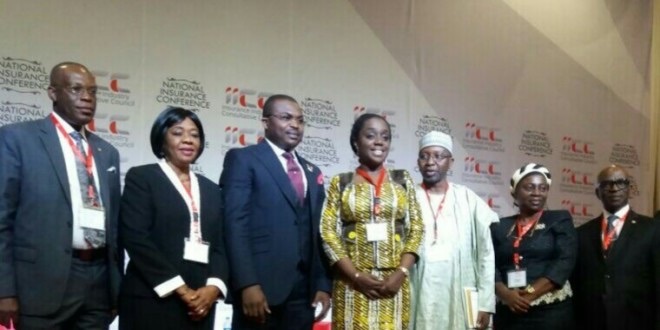 ADDRESS DELIVERED BY LADY ISIOMA CHUKWUMA, CHAIRMAN, INSURANCE INDUSTRY CONSULTATIVE COUNCIL (IICC) AT THE OPENING CEREMONY OF THE NATIONAL INSURANCE CONFERENCE ON MONDAY 11TH JULY, 2016 AT THE CONGRESS HALL, TRANSCORP HILTON, ABUJA. ➢ Engender a platform for developing and achieving joint-industry agenda. ➢ Enthrone an intra-industry conflict resolution mechanism. ➢ Take up and assume any other role that may serve the best interest of the Insurance industry in Nigeria. As we are all aware, the benefit of insurance to national economy cannot be overemphasized. But regrettably, these enormous potentials have been stultified, among others, by lack of intra industry cohesion. It is my utmost belief that a unified Conference of this nature would present the industry as a holistic sector, as well as enhance its image in the eyes of the various strategic publics and stakeholders. I must therefore convey the goodwill and appreciation of the leadership of the IICC to all the Industry Elders and the various constituent bodies for their firm conviction in the need for us to remain united and indivisible. Distinguished delegates, it is my privilege and honor to acknowledge and specially appreciate the National Insurance Commission, under the indefatigable leadership of the Commissioner for Insurance, Alhaji Mohammed Kari for the immense support the IICC has received from the Commission in sustaining this annual Conference. We must admit that under Alhaji Mohammed Kari the industry has become more ethical and professional, and we hope that things can only get better. It is quite apposite to note that the theme of this Conference, “EXPANDING NATIONAL RESOURCES AND INFRASTRUCTURE IN CHALLENGING TIMES” is apt and timely as it was informed by the need for the Insurance Industry in Nigeria to key into the drive of the present administration towards re-building a virile national economy through diversification and expansion of national infrastructural resources. We are living witnesses of the various efforts being made by the present administration to take our national economy out of the doldrums through the annexation of all latent national resources. This effort definitely calls for the support of all strategic stakeholders, of which the insurance industry is cardinal. That is why the Planning Committee has invited an array of distinguished speakers and discussants that would do justice to the subject matter. It is hoped that opinions canvassed at this national event would constitute a significant input into the renewed national economic revival plans. There will also be a Panel of Discussion on Compulsory Insurances amongst Insurance stakeholders as a follow-up to last year’s edition. Permit me to at this juncture commend the National Insurance Conference Planning Committee for their painstaking efforts, especially in the choice and assemblage of the very high caliber speakers and sessions Chairmen. The choice of Speakers also underscores the importance of the Conference and guarantees quality time for all participants. I discovered your blog site on google and examine a number of of your early posts. Proceed to keep up the excellent operate. I just further up your RSS feed to my MSN News Reader. Looking for forward to studying more from you afterward! ?